My neighbor is a Trip… No, literally! Photo courtesy of Madi McGuire. As a sophomore, I am fortunate to live in Apartment Village after the big Fairview over-packing controversy. If you never lived in Ross or Schwitzer Hall, I cannot explain to you how exciting it is to have my own room, a single shower without somebody else’s hair in the drain and an oven so that I can play Betty Crocker. Apartment life is quite different than living in a dorm. To me, it is much more fun. It took me two whole days and two grocery runs to finally run into my neighbors. Remember that small, adorable, drooly thing that wanders campus and serves as our mascot? That’s right—Trip is my neighbor! He lives there along with his owner Michael Kaltenmark, Kaltenmark’s wife Tiffany and their two sons, Miles and Everett. The first time Trip came over I fell to the floor so that I could bask in his furry cuteness. I also made sure to take plenty of pictures. I sent the pictures to my three roommates in our group message thinking I was the first to discover this phenomena. It turned out that they already knew and were not affected by my message, but who cares—I was still excited. Kaltenmark loves that Trip has someone other than his family to play with. “He has been dying to come over everyday,” he said. As long as we keep our door open, Trip will come visit us whenever he wants to with Miles and Everett. Trip may not be the typical apartment resident, though Kaltenmark says he gets along just fine and enjoys the attention. Miles and Everett are set to stop by at any time. We even plan on buying a basketball hoop so the boys can show us their skills. My roommates and I have just one goal for the year, and that is to make it onto Trip’s snapchat story just once. We are also invited to Trip’s snapchat famous “Fajita Fridays” with the family. 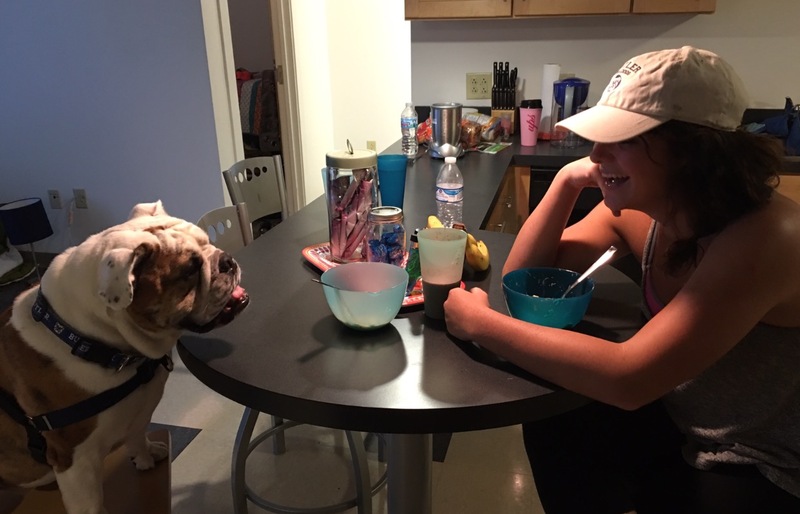 As if the luxury of living in Apartment Village is not enough, my roommates and I get to spend time with an amazing family and have the Butler Bulldog support us throughout the year. I thought that only in my dreams I would be this close to such a headlining canine. No one tell my hound that I will be hanging out with a dog celebrity. McGuire and Trip in front of their apartment doors. Photo courtesy of Madi McGuire.